Ernst Mayr’s influence on philosophy of biology has given the field a particular perspective on evolution, phylogeny and life in general. Using debates about the tree of life as a guide, I show how Mayrian evolutionary biology excludes numerous forms of life and many important evolutionary processes. Hybridization and lateral gene transfer are two of these processes, and they occur frequently, with important outcomes in all domains of life. Eukaryotes appear to have a more tree-like history because successful lateral events tend to occur among more closely related species, or at a lower frequency, than in prokaryotes, but this is a difference of degree rather than kind. Although the tree of life is especially problematic as a representation of the evolutionary history of prokaryotes, it can function more generally as an illustration of the limitations of a standard evolutionary perspective. 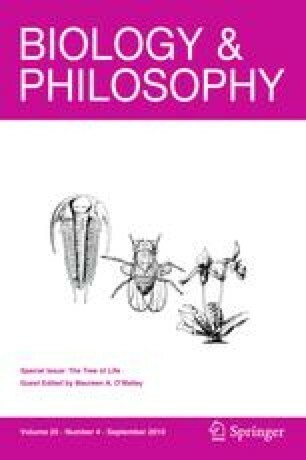 Moreover, for philosophers, questions about the tree of life can be applied to the Mayrian inheritance in philosophy of biology. These questions make clear that the dichotomy of life Mayr suggested is based on too narrow a perspective. An alternative to this dichotomy is a multidimensional continuum in which different strategies of genetic exchange bestow greater adaptiveness and evolvability on prokaryotes and eukaryotes. This paper was presented at the Halifax 2009 meeting of the Questioning the Tree of Life Network, sponsored by the Leverhulme Trust. I am grateful to the audience there for comments and also to the B&P referees who helped me sort out several points and avoid a number of errors. I owe many thanks to John Dupré, Sabina Leonelli, the BMBF Study Group for Evolution and Classification in Biology, Linguistics and the History of Science, and the ISHPSSB 2009 audience for discussion of previous versions of this paper. I also gratefully acknowledge the British Academy, which funded the presentation of this paper in Brisbane at ISHPSSB. The research for all these versions was funded by the ESRC as part of its programme at Egenis, University of Exeter.